The next step, merging layers, helps you to keep the file size relatively small. However, after you merge, you cannot easily go back and restore the image or start the process over, so be sure that you are happy with your results before you choose a merge command. 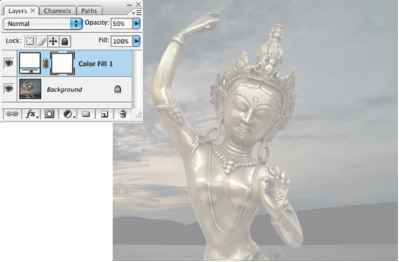 1 In the Layers palette, make sure that the Paint layer is selected. 2 Choose Layer > Merge Down to merge the Paint layer with the pear image. Now the two layers are fused as Layer 1. 3 Double-click the hand tool ( ) so that the entire image fits in the image window, or double-click the zoom tool ( 0 to reduce the view to 100%.